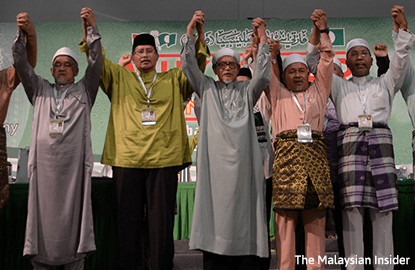 KUALA LUMPUR (Feb 22): Eight months after conservatives took over PAS's central leadership, its grassroots are clueless about the party's direction or where it stands in the national political landscape, a study finds. Think tank Ilham Centre said grassroots members were also baffled by party leaders' conflicting statements, especially when it comes to arch-rival Umno. The study, conducted among officers in PAS branches in the northern peninsula states, also found that many were dissatisfied with appointments of state officials by the central leadership. The central leaders themselves, said Ilham Centre’s Mohamad Hisomuddin Abu Bakar, have not been active in meeting grassroots at ceramahs and party programmes. He said members are also complaining of an absence of any strategy or plans from the leadership for the 14th general election. "The grassroots are starting to question what is the PAS central committee doing ever since its members won big in the party elections in explaining current issues to their members. "At the same time, their press statements have also contradicted each other," Hisomuddin told The Malaysian Insider. The Islamist party’s June elections were among the most divisive in its 55-year history. Its conservative leaders won a landslide victory, wiping out the faction dubbed the progressives. The progressives, made up by some of PAS’s most well-known parliamentarians and leaders, have since left the party to form Parti Amanah Negara (Amanah). PAS itself has opted not to join Pakatan Harapan, but still maintains ties with PKR, which is part of the new opposition coalition. Ever since, there have been questions as to PAS’s direction. Some leaders want closer ties with Umno, others insist the party is committed to being an independent opposition party. But the biggest complaint from PAS members, said Hisomuddin, was the contradicting public statements by its leaders. This includes statements from the party’s president, the deputy, the vice presidents and the secretary-general. The message being sent to the public is that PAS does not have an official stance on a given issue, and that these statements are personal views which contradict each other, Hisomuddin said. Members are also finding it difficult to accept the party’s stand on cooperating with Umno through the concept of "taawun" (working together for a common good). "There is no solid explanation for this policy. The members at the grassroots level are arguing among themselves about what it means and senior leaders have not come out with an official circular about it. "Can you imagine, all this while, PAS and Umno members have clashed in coffee shops, in suraus, over kindergartens, and now they are being told to 'work' with their political rivals? Some of them are saying they are going to take a break from their PAS activities," said Hisomuddin. The first part of Ilham centre’s study was conducted over the past two months among grassroots members in Kedah, Perlis, Penang and northern Perak. The second leg will cover Kelantan and Terengganu. Another complaint was that the grassroots members have not personally seen much of their top leadership since June last year. In comparison, Hisomuddin said the members met in the study claimed that the previous leadership was more out-going, frequently accepting invitations to ceramahs. "Those who do come down for ceramahs are not crowd pullers like before. Their ceramahs only attract PAS members and not the wider community. "Even national-level leaders such as the information or Youth chief can only attract small crowds." The central leadership's state-level appointments have also raised eyebrows in Kedah and Perak. "Officials in these state committees are not well known to members or they have controversial reputations," said Hisomuddin. Lastly, members complained about how the party had not started preparations for the next election. "One of the big reasons for this is that the old election experts and activists have already gone and joined Amanah. So those who are left have no experience in electoral operations," said Hisomuddin.